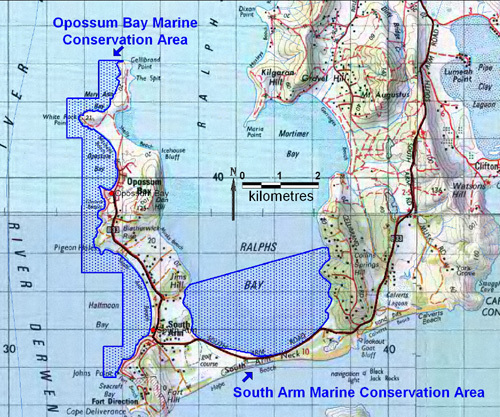 The Opossum Bay Marine Conservation Area is located in the southeast of the River Derwent between Gellibrand Point in the north and Johns Point in the south. The reserve comprises an area of 555.5 hectares and contains a mixture of sand beaches and rocky reefs with kelp beds and associated reef and sandy sediment ecosystems. The primary objective of the reserve is the protection of habitat for the endangered spotted handfish (Brachionichthys hirsutus) and is of interest as an area for scientific research on the species. The reserve also contains a resting area for shearwaters, a shark refuge, and significant habitat for shorebirds. The area was proclaimed a conservation area under the Nature Conservation Act 2002 on 9 December 2009. This reserve class provides for the protection and maintenance of the natural and cultural values of the area and the sustainable use of natural resources.